Race to the scene of the crime in the Lights and Sounds Police Car! This 1:20 scale vehicle is perfect for imaginative play, and made of a durable plastic designed to withstand the most thrilling adventures your child can think up. The Lights and Sounds Police Car has everything kids need to imagine chasing down bank robbers, patrolling the highways, and much more. Bring high-speed police chases to life with realistic lights and sounds, just like a real-life police car. With friction powered wheels this police car lets kids speed to the scene of the crime in no time. Learning about the work done by others in the community is an important part of childhood. 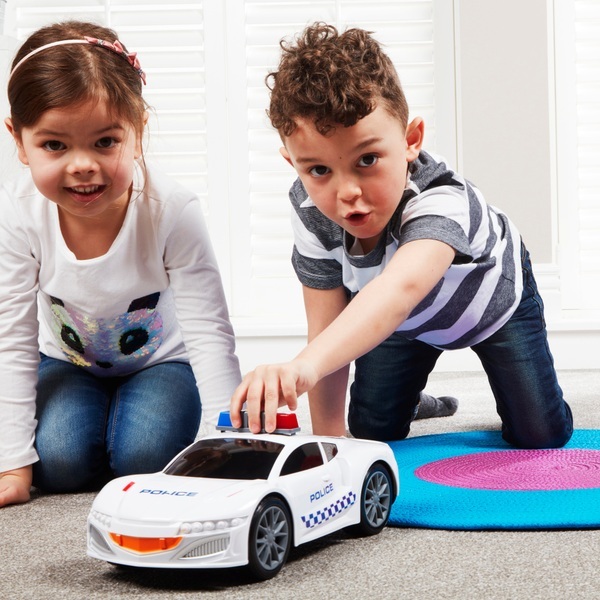 With the Lights and Sounds Police Car, kids can discover the exciting world of the police force. There’s no case this police car can’t handle!